[Review] Tankborn #2 is a Big Disappointment! Awakening. Sandler, Karen. $17.99hrdbk. 400 pp. Tu Books. April 9, 2013. 9781600609824. Karen Sandler’s book 2 in the Tankborn series about genetically engineered teens called GENS finds them fighting for their freedom from the world they were created in. GENS are slaves to the trueborns and are at the bottom of their societal caste system which literally divides the society by skin tone, amoung other variables. After waiting for what seemed like a lifetime for the 2nd in the series to come out, I must say I’m a little disappointed. What really got me geared up for the second installment was the release of a short online novelette, Sacrifice, which is free to the public at http://www.tankborn.com/#!free-short-story. What a delicious tease. Much to my disappointment, however, was the repetition of the original storyline and the amount of space this took up in the new novel. Granted you want to make it comfortable for new readers to hook into previous events, but in my humble opinion too much time was spent on the retell and not enough time was spent on new events. The action started hooking up in the last third of the book and was chunked together and wrapped up way too quickly. The fun and intrigue of this book series is the George Jetson-like environment with the flying cars and the futuristic world (400 years in the future) and yes the striated society. 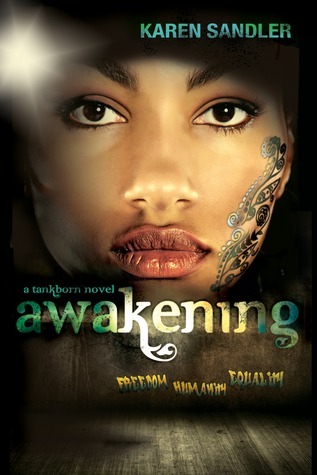 Tankborn was one of publishers Lee and Low’s new TU Inprint (http://umakrishnaswami.blogspot.com/2011/07/interview-wednesday-stacy-whitman-of-tu.html) which is dedicated to publishing YA fiction that features characters of mostly South Asian and black American origins. Because the first installment was so good, I will give this book a by, in anticipation of a stronger number 3, which is definitely in the plans. So sorry for the delayed response. Honestly the admin layouts have switched twice for me. Notifications used to come in email. I agree Tankborn was a let down for me but the issues it raises are very necessary to share. I have mostly black and Latino students in the school population and they need to see themselves included in the lit on the shelf of their school library. This is one of those books that belongs on the shelf for that purpose.